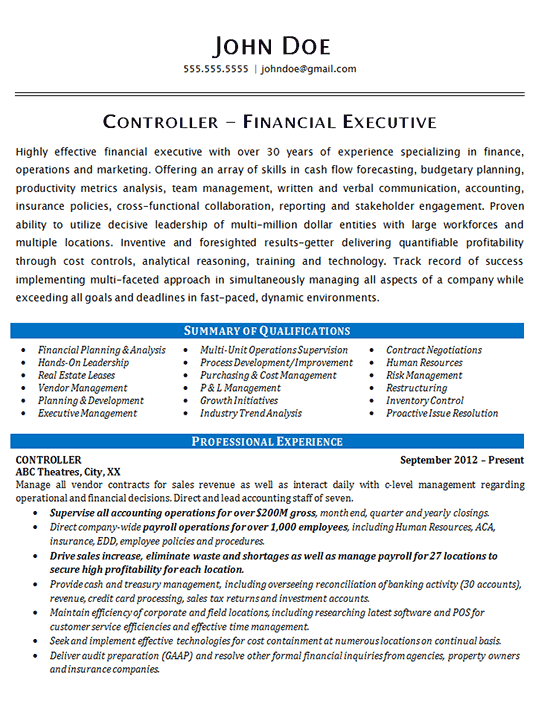 This resume was created for a higher level employee hoping to expand on his executive experience as a Controller in a large corporation. As someone with a lot of experience and skills, we provided a detailed introductory paragraph and Summary of Qualifications to ensure that potential employers see his value immediately. Now that the reader is intrigued, we expanded upon the client’s accomplishments with a detailed Professional Experience section. The more relevant and impressive bullet points were written in bold to have them further standout to the reader. This client had so much experience that we split his three oldest jobs into an Early Career Summary section. That way, they are still included and acknowledged, but the resume doesn’t begin to drag on. Additionally, his positions that were explained in great detail are far more impressive and relevant to his future career interests. Finally, Education and Training as well as Technology Proficiencies were listed to complete the resume. These works to show that this client is a well-rounded employee that brings a diverse skillset to his field. 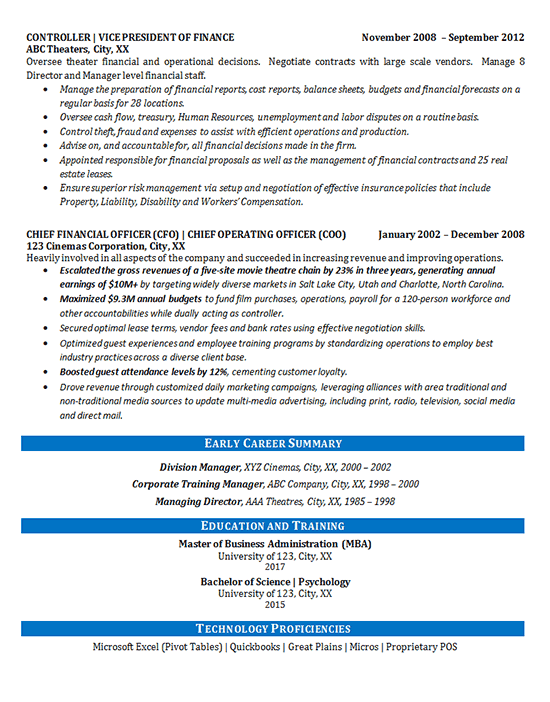 Highly effective financial executive with over 30 years of experience specializing in finance, operations and marketing. Offering an array of skills in cash flow forecasting, budgetary planning, productivity metrics analysis, team management, written and verbal communication, accounting, insurance policies, cross-functional collaboration, reporting and stakeholder engagement. Proven ability to utilize decisive leadership of multi-million dollar entities with large workforces and multiple locations. Inventive and foresighted results-getter delivering quantifiable profitability through cost controls, analytical reasoning, training and technology. Track record of success implementing multi-faceted approach in simultaneously managing all aspects of a company while exceeding all goals and deadlines in fast-paced, dynamic environments. Supervise all accounting operations for over $200M gross, month end, quarter and yearly closings. Direct company-wide payroll operations for over 1,000 employees, including Human Resources, ACA, insurance, EDD, employee policies and procedures. Drive sales increase, eliminate waste and shortages as well as manage payroll for 27 locations to secure high profitability for each location. Provide cash and treasury management, including overseeing reconciliation of banking activity (30 accounts), revenue, credit card processing, sales tax returns and investment accounts. Maintain efficiency of corporate and field locations, including researching latest software and POS for customer service efficiencies and effective time management. Seek and implement effective technologies for cost containment at numerous locations on continual basis. Deliver audit preparation (GAAP) and resolve other formal financial inquiries from agencies, property owners and insurance companies. Manage the preparation of financial reports, cost reports, balance sheets, budgets and financial forecasts on a regular basis for 28 locations. Oversee cash flow, treasury, Human Resources, unemployment and labor disputes on a routine basis. Control theft, fraud and expenses to assist with efficient operations and production. Advise on, and accountable for, all financial decisions made in the firm. Appointed responsible for financial proposals as well as the management of financial contracts and 25 real estate leases. Ensure superior risk management via setup and negotiation of effective insurance policies that include Property, Liability, Disability and Workers’ Compensation.